Our mobile pet spa is insulated and has pheromone diffusers to help calm and relax our important clients. Your pet will receive one to one attention in the pet spa for truly individual care, where the internal temperature is controlled to provide your pet with a comfortable, personal experience. Chris is a qualified groomer. Awarded City & Guilds, Dog groomer Level 2 with Distinctions & Level 3 Stylist, with Merits. NEW SERVICE PET TEETH CLEANING with the Emmi Pet Ultrasonic toothbrush. We pet care offer teeth cleaning service using the Emi pet non-brush ultrasonic toothbrush to break down plaque and kill bacteria improving your pet’s breath and oral hygiene. The process requires five to eight treatments to remove build up. However, dental decay is irreversible and not something we can improve. Treatments take about thirty minutes and are charged at £18.50 per treatment when booked with any Grooming package or £20.00 on its own. Chris has also completed the Peddy Mark Micro Chipping providers course and the Companion Animal Nutrition course from the Isle of Wight College. We offer advice on suitable nutrition and weight loss as well as maintenance for companion animals. 2. Need for a suitable diet (advice given). 3. Allowing the animal to exhibit normal behaviour patterns. 4. Need to be housed with or apart from other animals. 5. Need to be protected from pain, suffering, injury and disease. Due to health or coat conditions and general temperament, some dogs are unsuitable for a mobile grooming unit. We Pet Care reserves the right to decline its services. HOW TO PREPARE FOR YOUR DOG FOR GROOMING. Dogs are naturally inquisitive individuals and like to be active. To make the grooming process enjoyable and less stressful for your dog, please make sure they have been walked for at least twenty minutes (allowing them to empty their bowel and bladder) within the hour before their grooming appointment. The benefits to your pet cannot be over emphasised. We know time is short so why not book the pre- groom thirty-minute walk for £17.50. Eyes & Ears – checked for parasites and outer ear cleaned. Mouth & Nose – visual examination of mouth and teeth nasal passages for discharge and the nose tip for dryness. Microchip scanned and checked. Skin and coat – check for dry skin, and any abnormalities or parasites. Nails and feet pads – inspected for cuts abrasions and dryness. Nails are checked for signs of breakage and trimmed, if required, on full grooms. Body shape and general appearance with nutritional requirements in mind. We will give you confirmation of any issues noted with relevant suggestions (where qualified to), or referral to your own vet for treatment / advice. All prices are subject to change at any time and will be confirmed at the start of the groom. However disruptive behaviour and or matting will incur additional charges. If your pet is not on this list give us a call for a personal quote 01622 910065. A full groom starts with a visual health check. Light de-shedding before bathing in the pet spas on board. Hydro bath in softened water with natural Wildwash shampoo and coat conditioning products. Air blasting of the coat to remove dead under coat and speed the drying process. The coat is dried completely with warm air hairdryer and brushed to prepare the coat for styling to your own requirements. Nails are trimmed and pads have excess hair trimmed to reduce the mess in your home, and possible infection or matting of the hair in the paws. The outer area of the ear is cleaned. Your pet’s sanitary areas are trimmed to maintain personal cleanliness. Pads will be massaged with Wildwash paw balm to keep their pads soft and flexible avoiding the pain of dryness and possible infection. Begins with a visual health check. Bathing in the pet spa’s onboard hydro bath, in softened water, with natural Wild wash shampoo and coat conditioning products. Air blasting of the coat to remove loose dead undercoat (to speed the drying process). The coat is dried completely with warm air hairdryer and brushed. Should you require me to de-matt the dog coat this is an additional cost equal to the Full groom price. Dogs with matted coats need extra attention. Matts left in a dog’s coat only grow tighter and can strangle the pet’s skin, We Pet Care subscribe to the Animal Welfare Act and therefore will not spend any longer than 15 minutes de-matting your dog. Matts can be very difficult to remove, and may require the dog to be clipped shorter than you would like. When necessary, removing a heavily matted coat includes risks of cuts or abrasions due to warts, moles or skin folds trapped in the mats. The after effects of matt removal can include itchiness, skin redness and self-inflicted irritations or abrasions. Regular grooming appointments and maintaining your dog’s coat at home between grooms avoids the suffering caused by matts. There is an extra charge for matted dogs as it is a lengthy and risky process which causes excess wear and tear to our equipment. We will not take responsibility for any after effects, or injury caused by matting, and you will be required to sign prior to the groom taking place. We pet care offer a teeth cleaning service using the Emi pet non-brush ultrasonic toothbrush to break down plaque and kill bacteria improving your pet’s breath and oral hygiene. The process requires five to eight treatments to remove build up. However, dental decay is irreversible and not something we can improve. Treatments take about thirty minutes and are charged at £18.50 per treatment when booked with any Grooming package or £20.00 on its own. All grooms are subject to a nonrefundable 50% two weeks prior to the appointment. This is refundable or appointments can be changed with ninety-six hours’ notice. Should we arrive at the booked location and no one is home or you change your mind the full fee is then charged. We would like to photograph your pet before, during and after its groom. These may be used on our website, social media or other printed materials. If you do not wish for your dog to feature in any of our marketing that’s fine you will be asked for permission on signing your consent to groom. We Pet Care are proud to offer all our customers the Wild wash range of natural products, protecting your pet’s health. Your dog loves you, and we find they are often more excitable which, can increase anxiety if they can see, smell or hear their owner. This can mean they move around much more, which can increase the risk of accidents. Therefore, we find it better when owners do not stay. But please, rest assured we will look after your pet. Owners need to inform We Pet Care if your dog bites, has bitten, or is aggressive to people, other pet(s) or specific elements of grooming. Muzzles may be used if necessary. We Pet Care reserves the right to refuse or stop services for such pet(s) at any time before or during the grooming process. Grooming equipment is sharp, even though we use extreme caution in all situations, accidents can still occur including, cuts, nicks, scratches, over-trimming of nails, etc. In most cases this can happen when a dog is moving around excessively. Please do not approach the mobile pet spa whilst they are still being groomed as this can lead to excitement or anxiety from your pet increasing the risk of injury to all parties. Every effort will be made to ensure your dog is groomed as safely as possible, but an over excited pet can be dangerous to continue to work on. In the event of a grooming related injury, we will take your dog to the nearest veterinarian immediately. If you are dissatisfied with any aspect of your pet’s groom please let us know and we will do our best to resolve any concerns you have. 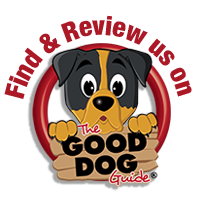 We make notes about every dog after each groom, so if there is something that you are not happy with, then please let us know so that we can make a note to take a different approach next time.